It’s Remote time baby! 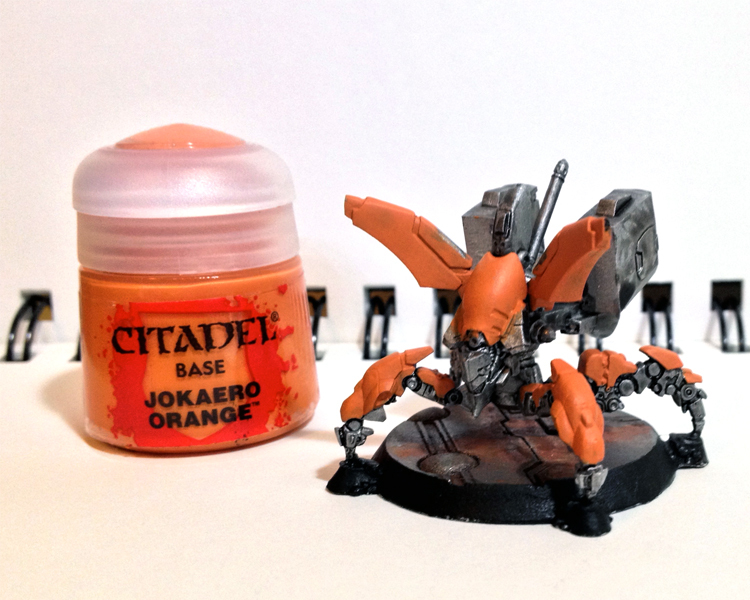 After painting a bunch of regular infantry for my Corregidor army, I decided it was time to paint up a Zond or two. What’s a Zond? A quick look at the Infinity website tells us, “Basically, it is a kind of semi-autonomous robotic porter, a high-tech beast of burden.” So let’s get to it! As you can see here, the base is already done. 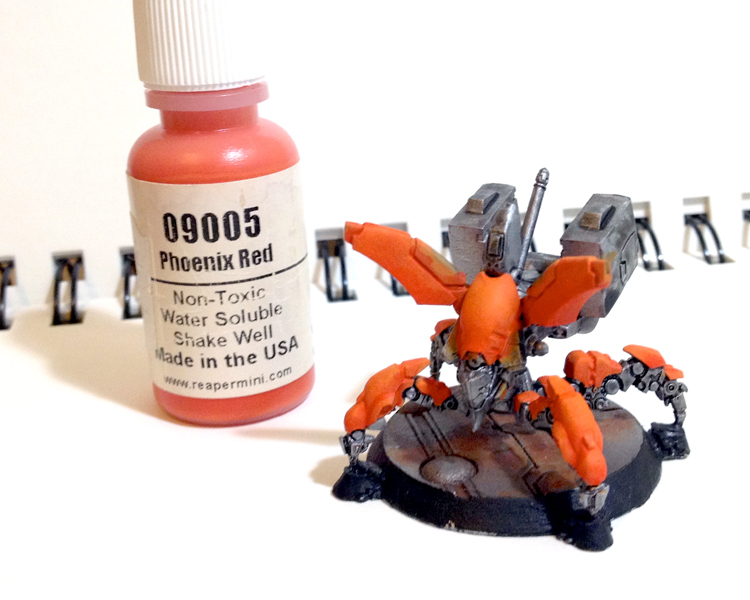 I usually dry-brush bases (which is pretty messy) first then move onto the more neat work. It also looks better on the table to have all my bases finished even if eveything else is a work in progress. 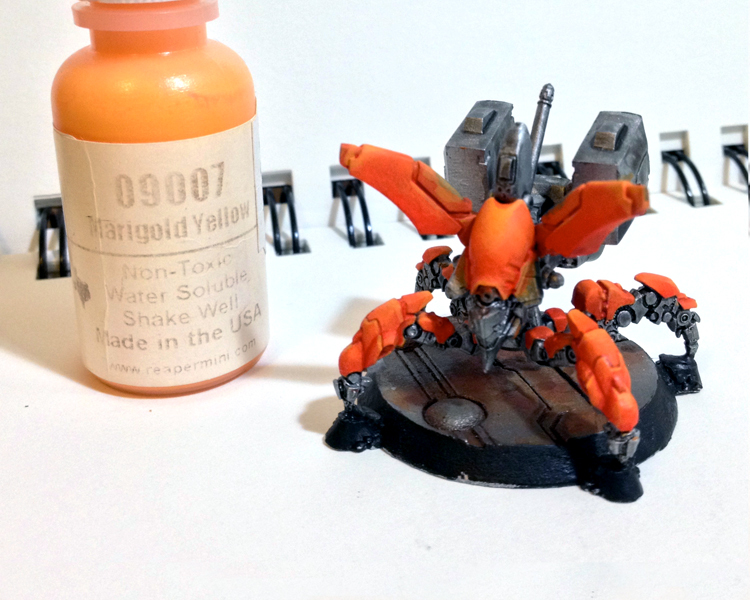 I also did a quick base coat of metallic paint followed by a wash of black and a base-coat of orange. 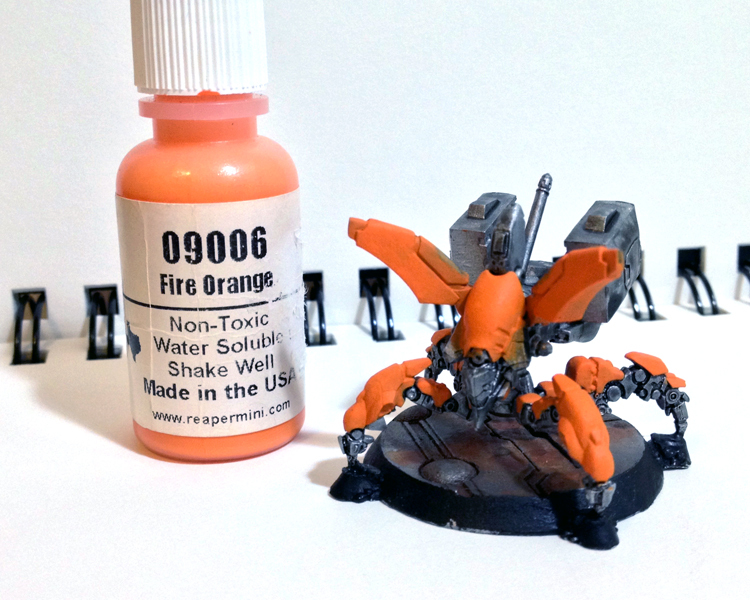 The initial coat of Jokaero Orange acts more like a primer for this coat of Fire Orange. It would’ve taken a lot more coats of this color to get good coverage. Too much paint bad! This step is all about contrast. 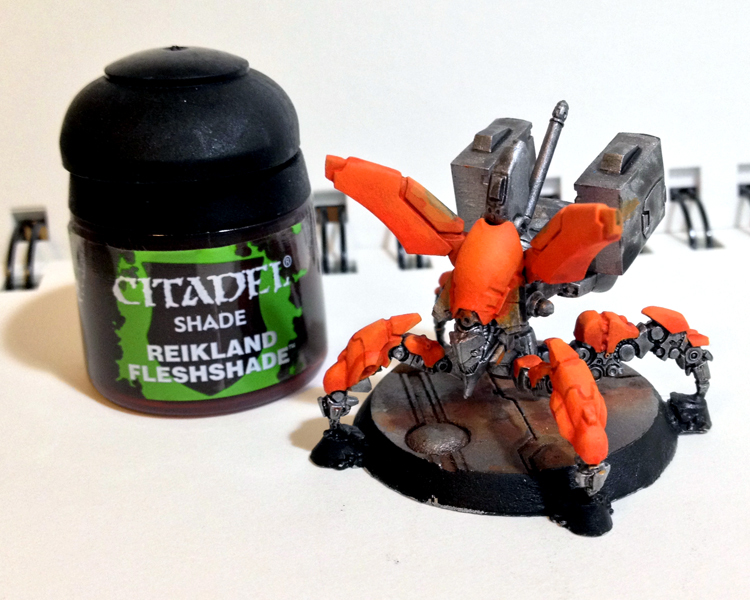 I used Reikland Fleshshade to define the spaces between the armor plates. And finally a highlight of Marigold Yellow. Afterward I went back and picked out any mistakes or rough areas. So there you have it. Orange is done. Later this week I’ll post the next color, BLUE! Oh snappy! This entry was posted in Miniature Painting, Tutorials and tagged Infinity, Infinity the Game, Miniature Painting, Nomads, Table Top, Work In Progress by osographic. Bookmark the permalink. That orange looks fantastic! Great work! Thanks Leeman! The pics aren’t the best quality (I used my iPhone to take them) but you get the idea. I’ll add a better quality image of the final results once I complete the other color tutorials. Hi, very nice step-by-step tut. The orange really looks smoothly blended. Are you using ‘Juices’ for this effect?? Thank you! The only thing I use outside of water is Liquitex’s Flo-Aid. I’ve never heard of ‘Juices’. 😛 Please share the knowledge. Is that something added to paint? I guess the term comes from some French painters and translates not that well into English 😉 ‘Juices’ as far as I understand are simply very thinned down paints. For instance 20:1 or 10:1 water to paint ratio. One then gets a bit of that coloured water on the brush, removes most of it on a tissue paper and then paints many layers, which in the end will give a extremly smooth transition due to the small amount of pigment on the brush and resulting slow pigment build up on the mini. I tried it a couple of times on cloaks so far and it does work, but to really get it smooth I need more practise. They sound a bit like a wash, but I guess the point is to have maximum control where the paint ends up. Wow, thanks for that excellent description D&B!